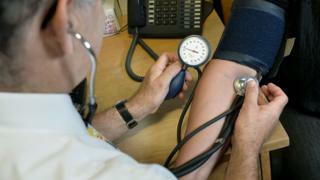 Image caption Campaigners have said the new referral system was a "waste of cash"
Patients in Brighton are waiting more than one month to be referred to a consultant by their GP. Brighton and Hove Clinical Commissioning Group said the problem is with the national NHS referral system failing to "link up" with a new system being run by Optum Health Solutions. It said Optum was an "experienced provider" of referral management and the fault lay with the NHS system. However, campaigners have branded the new system as a "waste of cash". Katrina Miller, from Sussex Defend the NHS, said: "Of course we want value for money, but so much money is being spent on this new system that could be set to improving the present system we already have." A spokeswoman for the CCG said: "Since its launch, the new service has been affected by an IT problem that is preventing effective 'linking up' with the national NHS e-referral system." She said GPs had been using the referral management system (RMS) for managing hospital appointments since 2008. "The procurement of a new RMS earlier this year was driven by feedback from local GP practices and patient representatives and a three-year contract was awarded to Optum Health Solutions in June," she said. "Optum is an experienced provider of referral management services with a proven track record over the past five years in Hounslow and more recently in Ealing, Dorset and Bedfordshire." Correction 8 October 2015: This story has been amended to make clear that the problem lies with the national IT system and not the service provided by Optum Health Solutions.